For a while now, a great deal of mystery has surrounded the immigration details of one of my 2nd great grandfathers, Alexander Balla Sr. (1886-1950). According to oral family history, Alexander left the village and country of his birth, Eszény, Hungary (now Eseny, Ukraine), for the United States when he was between 18 and 22 years old, working aboard the passenger ship in exchange for part or all of the passage fee. Oral family history about his immigration also adds that although one of the reasons Alexander immigrated to the United States was to be with family members that were already living there, another significant reason was the fact that his life had been threatened in Eszény by someone or a group possibly connected to the Black Hand. Despite these details from oral family history, I was never able to track down a shipping manifest for Alexander’s immigration. 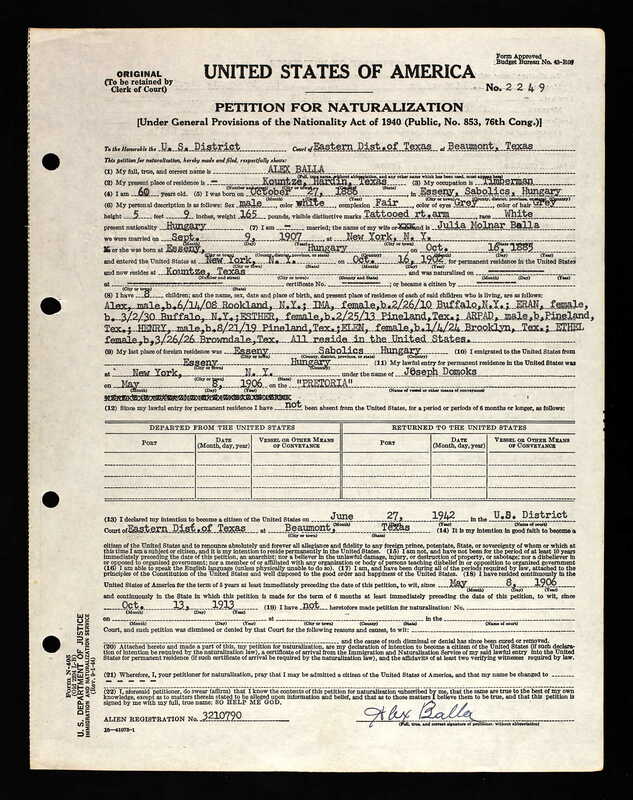 Recently, Ancestry.com made Texas Immigration and Naturalization records available, which has helped clear up some of the mystery surrounding his immigration. According to both his Declaration of Intention and Petition for Naturalization, which were filed in 1942, Alexander immigrated from Eszény to the United States on May 8, 1906 aboard the SS Pretoria, arriving in New York, New York. In addition to providing the date of his immigration, Alexander’s Declaration of Intention and Petition for Naturalization provide an additional, and highly interesting, fact about his immigration to the United States. According to these records, Alexander did not arrive in the United States under the name “Alexander Balla,” “Alex Balla,” or even “Sándor Balla.” Instead, he states that his lawful entry for permanent residence in the United States was done under a completely different name, that of “Joseph Domoks.” Seeing this was surprising, as there was no mention of his using an assumed name in oral family history or on any other historical record. Although there is a lot of mystery surrounding the threat made against his life, including who exactly did so, it is likely that this motivated him to change his name in order to conceal the fact that he was leaving the country, as well as concealing where he was immigrating to. The information provided by Alexander’s Declaration of Intention and Petition for Naturalization records, is, moreover, supported, with slight differences, by the SS Pretoria ship manifest for his arrival. 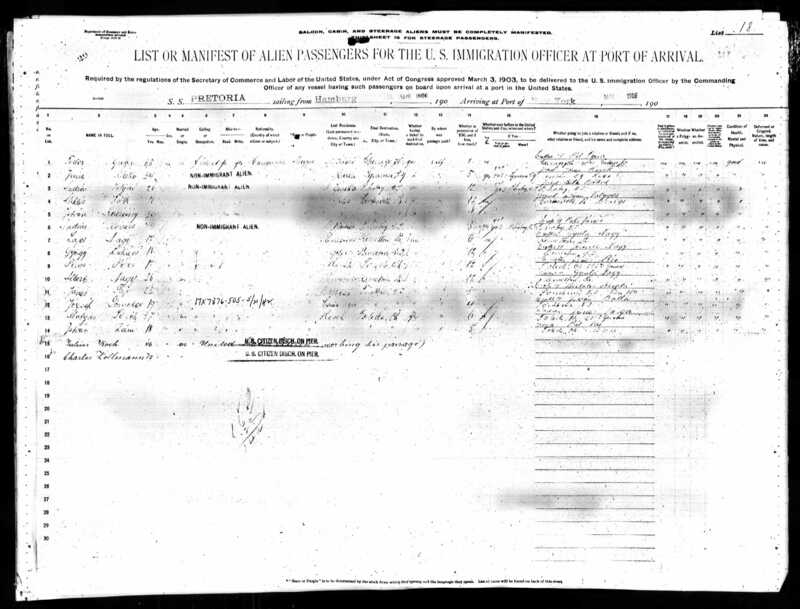 According to this record, Alexander arrived on May 6, 1906, instead of May 8, 1906 as stated on his naturalization records. His name is enumerated on this ship manifest as “Jozsef Domokos” (or “Jozsef Jomokos”), which is slightly different than what is found on his naturalization record (“Joseph Domoks”). This immigration record also states that Alexander arrived in the United States to be with his brother, István Balla (Steven Balla Jr.), who he reported was living in Tompkins Cove, Rockland Co., New York. 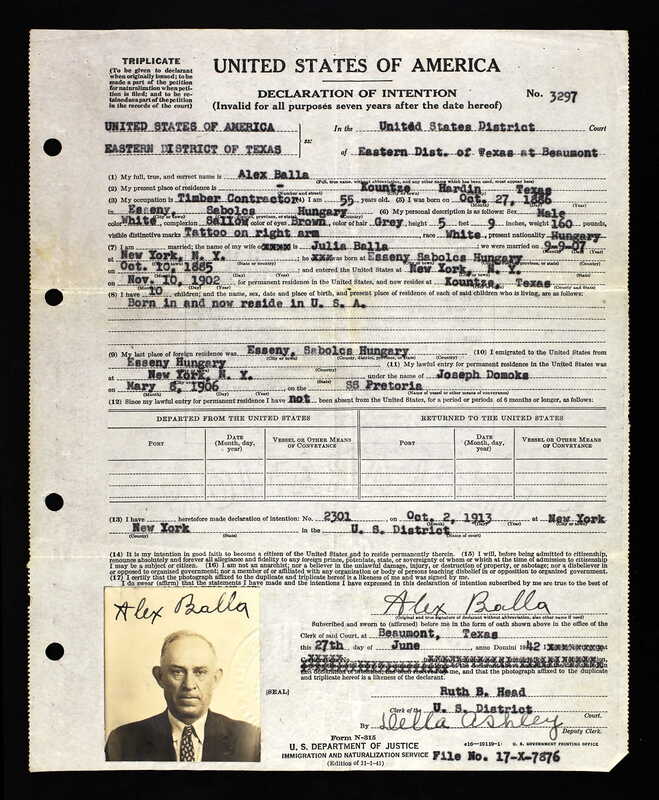 Immigration Record for Alexander Balla, who appears on line 12 of the manifest with his assumed name of “Jozsef Domokos” (or “Jozsef Jomokos”). Prompt for March 25 — Tell how a female ancestor interacted with her children. Was she loving or supportive? A disciplinarian? A bit of both? In general, my female ancestors for whom I know how they interacted with their children did so in more of a loving or supportive way, than as disciplinarians–a role that was usually held by my male ancestors. However, my female ancestors could certainly fill the role of disciplinarian if they had to. My paternal grandmother, Margaret Ann (Lapham) Kernan (1936-2004), was not usually the disciplinarian, but certainly did not look the other way when her children (or grandchildren) did or said something she did not approve of. She was more subtle in her disapproval, however. More often than not, she turned to her husband to handle disciplining anyone who required it. From what I understand about her grandmother (my 2nd great grandmother), Anna Margaret (Leishman) Lapham (1875-1951), she was both loving and supportive, but as a deeply religious person whose husband was frequently away working, did not spoil her children by sparing the rod. Horace & Anna Margaret Lapham Family: (Front Row) Nellie, holding her son James, Anna Margaret, Theodore, and Peggy. (Back Row) Wilbur, Charles, and Orville. 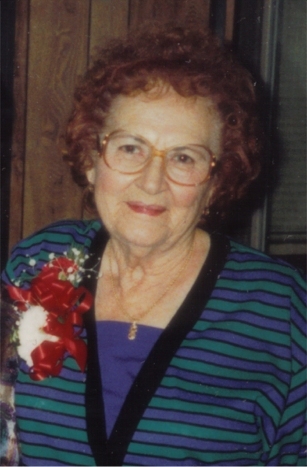 My maternal great grandmother, Irene Vera (Balla) Sebok (1913-2006) would discipline her children, grandchildren, and even great grandchildren if they did something she did not approve of, but she was also loving and supportive as well. I am told that her mother, Julia (Molnar) Balla (1885-1962), could be the typical sweet, loving and supportive mother and grandmother, but could also be a disciplinarian, so much so that her children and grandchildren knew not to act up around her. Julia (Molnar) Balla with Grandson, Paul. From what I understand about my other maternal great grandmother, Goldia “Goldie” Mae (Worthington) Hamilton (1912-2006), she was almost always loving and supportive, as her husband always filled the role of disciplinarian. The image of Goldie that I have always been left with regarding her relationship with her children (with respect to discipline) was that she was a lot like Jane Darwell‘s role as Ma Joad in the film adaptation of The Grapes of Wrath, loving and supportive even (perhaps) to a fault. Harry (far left) & Goldie (far right) Hamilton with Relatives. Goldie is holding a young girl, possibly a niece. Prompt for March 24 — Do you share any physical resemblance or personality trait with one of your female ancestors? Who? What is it? I am told by family members that I share some physical resemblance to my paternal grandmother, Margaret Ann (Lapham) Kernan (1936-2004), and to other members of her family. I have fair skin, blonde hair, and green eyes (originally blue). I also share some resemblance to other members of my family, but they are all male. As for personality traits, I share some with my maternal great grandmothers, Irene Vera (Balla) Sebok (1913-2006) and Goldia “Goldie” Mae (Worthington) Hamilton (1912-2006). My great grandmother Irene was notorious for being a “neat freak.” I have always been that way as well. Like her, I can get quite upset if someone makes a mess and doesn’t bother to clean it up. (It has always been interesting to me that my fraternal twin brother is the complete opposite.) I also inherited what some call the “worry gene” from my great grandmother Irene. She tended to worry about little and big things, and about her family members, which I have a tendency to do. Although I never got a chance to get to know her, I am told that my great grandmother Goldie loved to laugh, and always tried to find a reason to laugh, even in difficult moments, which is a trait I share with her. The Female Ancestors I Share Traits With (L-R): Margaret (Lapham) Kernan, Irene (Balla) Sebok, and Goldie (Worthington) Hamilton. Prompt for March 22 — If a famous director wanted to make a movie about one of your female ancestors who would it be? What actress would you cast in the role and why? There is one ancestor for whom I know this would thrill–my maternal great grandmother, Irene Vera (Balla) Sebok (1913-2006). I say this would thrill her because she wanted, in her youth, to be an actress. Growing up in rural Texas, the excitement of the celebrity lifestyle in the Golden Age of Hollywood undoubtedly appealed to her, as it did for many of her generation. Working around numerous celebrities at the Arrowhead Springs Hotel probably only served to continue this desire, however brief it must have been. She once told me that soon after her arrival in California in the 1930s, she was, while out with some of her relatives that lived in the state, approached by a talent agent that wanted her to have some head-shots done, but being unsure if it was a scam or not and having just met the man she would marry, she didn’t pursue it. Picking what celebrity would play my great grandmother in a film is difficult. I really cannot think of any living actress that she resembles significantly. To make the selection a little easier, I searched for a celebrity look-a-like generator. I read that the best is an iPhone app from MyHeritage. Not owning an iPhone, I found a free one instead called Celebrity Look A Like Generator by Picadilo.com. Unfortunately, this generator provided more laughs than clarity when trying to match my great grandmother (and other relatives) to a celebrity, as many of the “matches” were far from accurate. This was made worse by the fact that this particular generator does not have the ability to separate genders, so a female photo would be matched to both male and female celebrities. Nevertheless, one female celebrity came up more than any other in my attempts to find a match to various photos of my great grandmother, which was Merly Streep. I personally don’t see the resemblance, but Merly Streep is an amazing actress known for playing real-life characters who I think could certainly portray the ups and downs of my great grandmother’s life, as well as capture the layers of her personality, which could range from sweet to on the war path. Prompt for March 21 — Describe a tender moment one of your female ancestors shared with you or another family member. This particular challenge is a bit difficult for me, given the fact that for most of my ancestors that I had a chance to interact with I was too young for them to really share much with me that was personal. However, this is not to say that each of my grandparents and great grandparents that I had a chance to get to know didn’t treat me tenderly, for they most certainly did. I knew that they loved me (because they told me), and they certainly bought me things and gave me lots of attention. Nevertheless, when I read this prompt I immediately thought of one moment in particular involving my maternal great grandmother, Irene Vera (Balla) Sebok (1913-2006). Several years before she died, I had the opportunity to ask her questions about her family and what it was like growing up. During one of the sessions, she was telling me about her siblings, and her twin brothers, Frank Balla (1912-1920) and John Balla (1912), came up. Being a twin, I wanted to know more about them, since I had never met them or really heard anything about them before. John died soon after birth, while Frank died at the age of 8, after they left New York and settled in Texas. The story of Frank’s death was particularly moving for her (and me), and it was clear to me how much she loved her brother. Frank, like his brother John, was a “blue baby,” and had health problems throughout his short life. My great grandmother recalled vividly the day he died at their farm in Texas. Their mother woke them all up early to do chores and go to school. Being early, it was cold and she liked to give them coffee with milk and cinnamon, along with their breakfast. Frank loved it and wanted more, but their mother was busy doing housework and told him to go outside with the others, even raising her voice because he was persistently asking for more of the coffee. Soon after Frank went outside, one of the horses on the property was running around out in the filed and ran into some barbed wire. The horse was a bleeding and feel to the ground, probably with a broken leg. Because of its injuries, they had to put the horse down. Unfortunately, Frank witnessed the whole thing and went into shock. He died from heart failure at 10:00 am that same day. As my great grandmother finished telling me the story, she was in tears over her brother’s death. She repeated a few times, “if only Mama gave him some more of that coffee.” It was a very sad story and a tender moment about life, death and family that I shared with my great grandmother. On April 5, 1925, eighty-eight years ago today, Esther “Esta” (Szabó) Balla (1857-1925), my 3rd great grandmother, died in Monterey Co., California. Following her death, Esther was buried in the I.O.O.F. Cemetery in Hollister, San Benito Co., California. Esther was born in 1857 in Eszény, Szabolcs County, Kingdom of Hungary, Austro-Hungarian Empire (now Eseny, Ukraine) the daughter of Ferenc Szabó (?-?) and Eszter UNKNOWN (?-?). In about 1875, she married István “Stephen” Balla (ca. 1858-1930) in Eszény, with whom she had seven children. In about 1892, István left his family for America, settling first in Pennsylvania and then Cuyahoga Co., Ohio. He did so either to send for his family later or with the intent on abandoning them. The later seemed to be the case, as he remarried and had children soon after arriving. In 1907, Esther arrived in the United States with one of her daughters, joining two sons and another daughter. She did so under the name “Esther Istvanne Balla,” which means “Esther, Mrs. Istvan Balla,” possibly indicating she was somewhat unaware that her husband had moved on. According to oral tradition, she arrived with the intention of finding him. When one of her sons did, István abandoned his second family and went with his first one. My great grandmother, Irene Vera (Balla) Sebok (1913-2006) remembers meeting both Esther and István before they moved to California. She once told me that she remembered the wonderful food her grandmother made, particularly the homemade bread. According to oral history, Esther and István moved to California together, though records are unclear if the two remained married or even in the same household. Prompt for March 18 — Shining star: Did you have a female ancestor who had a special talent? Artist, singer, actress, athlete, seamstress, or other? Describe. Although I have not yet found any female ancestor who was famous for her talents, I do have many women in my ancestry that were talented. Many of my female ancestors were very talented cooks, with many of their recipes being handed down for generations. This is particularly true for my maternal grandmother’s side of the family. My maternal grandmother, Alberta (Sebok) Hamilton (LIVING), her mother, Irene (Balla) Sebok (1913-2006), and her mother, Julia (Molnar) Balla (1885-1962) were all accomplished cooks, making all kinds of Hungarian dishes and desserts. This seems to have run in the family, given the fact that Julia’s sister, Elizabeth, was a professional chief in New York. In addition to cooking, I have some female ancestors with artistic leanings. My paternal grandmother, Margaret Ann (Lapham) Kernan (1936-2004), was a talented artist. She enjoyed painting, particularly murals. In my grandparents home in California before they sold it, there was a large willow tree mural my grandmother painted. Sadly, no photos appear to exist of this. She also enjoyed drawing. I recall my father telling me that she drew portraits of several members of her family, including her mother. Additionally, several female ancestors were also talented in knitting, crocheting, and quilt/afghan making. My maternal great grandmother, Irene (Balla) Sebok (1913-2006), made many doilies, quilts or afghans, and other items. I have a few of them, including a pillow she made me. Although I already mentioned it in a previous post in this challenge, another talent of a female ancestor I uncovered is writing poetry. My 2nd great grandmother, Anna Margaret (Leishman) Lapham (1875-1951), wrote numerous Christian themed poems. Fearless Females Challenge: March 17 – Social Butterfly? The following post continues the month long Fearless Females Challenge by Lisa Alzo, author of The Accidental Genealogist blog, which is focused on “celebrating and honoring ‘fearless females’ in our family trees” to mark National Women’s History Month, which is the month of March, with a post responding to unique prompts for each day of the month. Prompt for March 17 — Social Butterfly? What social organizations or groups did your mother or grandmother belong to? Sewing circle, church group, fraternal benefit society or lodge? Describe her role in the group. While researching my family history, I have uncovered male ancestors involved in various social organizations, such as the Masons, the Elks, the Odd Fellows, etc. I have, however, found few female ancestors with records of involvement. I have had some that were involved in the Daughters of the American Revolution, though I am uncertain if they participated in any meetings. Apart from this, I do have some that were heavily involved in their churches. Apart from these. the closest I have found for my female ancestors include my paternal great grandmother, Alice Lucretia (Wellin-Lapham) Graber (1916-1985), and my maternal grandmother, Alberta (Sebok) Hamilton (LIVING). My paternal great grandmother, Alice Lucretia (Wellin-Lapham) Graber (1916-1985), was employed during WWII as a welder for the Oregon Shipbuilding Corporation in Portland, Multnomah Co., Oregon. In addition to this, she was a member of the International Brotherhood of Boiler Makers, Iron Ship Builders and Helpers of America, which is a trade-union. Alice was initiated on October 1, 1943, and regularly payed her dues. While going through some items that belonged to her following the death of her daughter Marla, her membership and dues book was discovered. Presently, I do not know how actively involved Alice was apart from paying her dues, which was likely a required part of her employment as a welder. As for my maternal grandmother, Alberta (Sebok) Hamilton (LIVING), she was involved for many years with the Order of the White Shrine of Jerusalem, a Masonic social organization that was founded in 1893 and comprises both men and women. She joined this organization around the time her husband, Lee Hamilton, became a member of the Masons. Throughout her involvement with the organization, she served in the offices of Worthy Guide and Worthy Shepherdess in her local chapter. Fearless Females Challenge: March 16 – Let’s Do Lunch! Prompt for March 16 — If you could have lunch with any female family member (living or dead) or any famous female who would it be and why? Where would you go? What would you eat? For me, this challenge is a difficult one because I think that I would not mind having lunch with each of my female ancestors, if I could. I can only imagine the information and stories that they could share. However, I suppose I could answer this prompt in one of two ways. First of all, I think I would like to have lunch with my female ancestors that passed away in my lifetime. This would particularly include my paternal grandmother, Margaret Ann (Lapham) Kernan (1936-), and my great grandmothers, Maxine Elizabeth (Davis-Kernan) Smith (1912-1992), Pauline Katherine (Rains-Rowlands) Kernan (1913-1997), Alice Lucretia (Wellin-Lapham) Graber (1916-1985), Goldia “Goldie” Mae (Worthington) Hamilton (1912-2006), Irene Vera (Balla) Sebok (1913-2006). This luncheon would also include my only 2nd great grandmother that passed away in my lifetime, Lois Beatrice (Agee) Wellin (1897-1983). An alternative luncheon would involve my immigrant female ancestors from my Kernan, Lapham, Hamilton, and Sebok lines, or the earliest known female I have in those lines if the immigrant ancestor is unknown. This would include Martha Rose (Sheridan) Kiernan (1797-? ), Mary (Mann) Lapham (1640-1712), Jennie M. (Lightcap) Heldman (1872-1905), and Roza Mari (Peto) Sebok (1871-1937). It might also include other female immigrant/earliest ancestors, such as Anna Eliza (Backer-Stearns) Tice (1854-1919), Rebecca (Gibson) Stearns (1635-1698), Sarah (Spinney) Davis (1746-? ), Mary Ann (Wys) Beeney (ca. 1784-1857), Ann (Forsyth) Leishman (1828-1896), Anna Elizabeth (Stålberg) Lowenburg (1869-1918), Anna Elizabeth (UNKNOWN) Lightcap (?-? ), Alice (Taylor) Worthington (1662-1729), Elizabeth (Grant) Gifford (1615-1683), Eszter (Szabó) Balla (1857-1925), and Julia (Molnar) Balla (1885-1962). In either set up, I don’t think we would go anywhere in particular. I think it would be at my parent’s home. 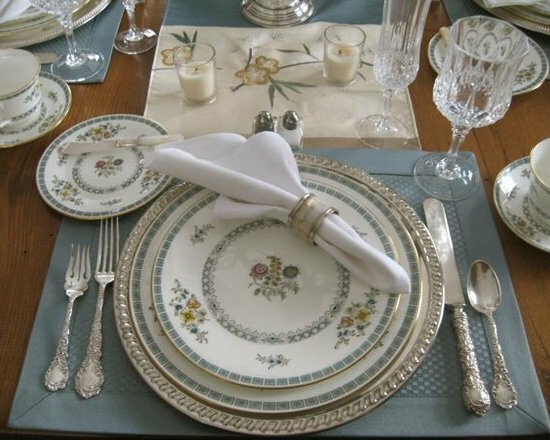 I would want each of them to prepare their signature dish (the women in my family all love to cook); and we would have a party-type luncheon similar to the Christmas parties my grandmother had when I was a kid. Lots of food and lots of talking. I think that would be the ideal luncheon for me with any of my female ancestors. Prompt for March 15 — Write a six-word memoir tribute to one of your female ancestors. This challenge is a tough one, as it is very difficult to sum up a person in only six words. However, I chose to do one for my maternal great grandmother, Irene Vera (Balla) Sebok (1913-2006), who would have been 100 years old this year. My six-word memoir tribute for her is: A simple love, like blooming roses. The context of this memoir tribute is my great grandmother was a loving person, though she could be feisty and tough at times. Her love for her family was a simple and uncomplicated love. She also had a great love and passion for roses, a garden of which she kept and tended to most of her life.